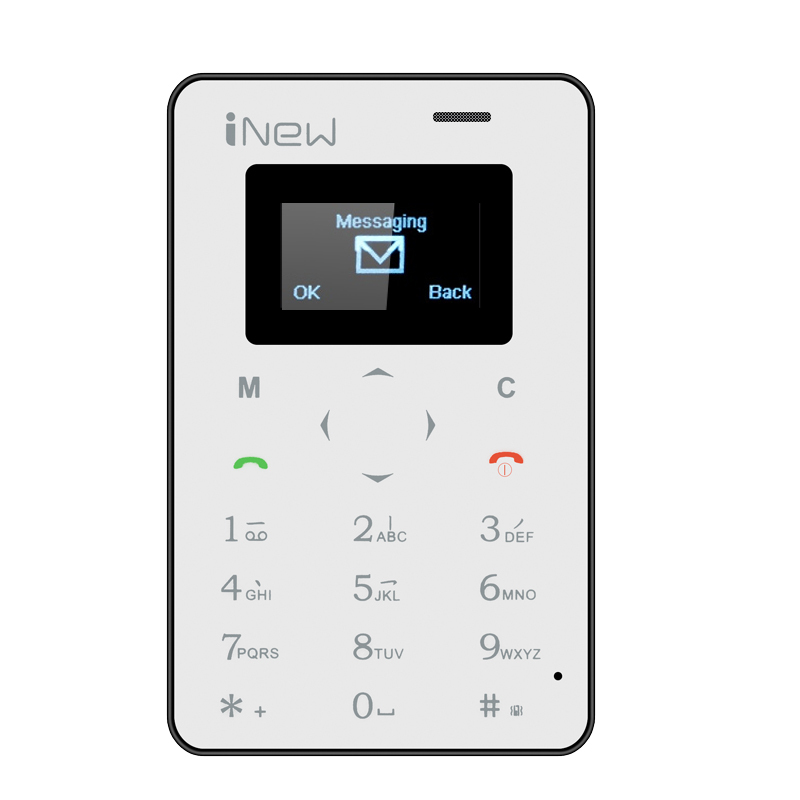 Successfully Added iNew Mini 1 Credit Card Phone - Quad Band GSM, Bluetooth Sync, Remote Camera to your Shopping Cart. The iNew Mini 1 has to be one of the smallest phones in the world. It’s smaller than a credit card and not much thicker. Measuring an impressive 85 x 52 x 4 mm you can slip it in your wallet or purse and hardly notice it is there. It's a great back up phone or the sort of mini device that can be taken with you on a night out without weighting you down or getting in the way. This ultra slim mobile phone accepts GSM SIM cards with support for 850/900/1800/1900MHz frequencies. This mini phone can work independently or via a Bluetooth connection to your regular phone and offers remote camera functions and music playing as well as all your standard call options. There is a on /off lock switch at the bottom so you don't accidently turn it on when in your wallet and a built in 360mAh battery offers enough usage for day. This small but full function phone is your easy to use companion for holidays, getaways or night outs and its discreet size won’t weigh you down. This Mini Credit Card Sized Phone comes with a 12 months warranty, brought to you by the leader in electronic devices as well as wholesale Phones..